Venue (by Proline) is proud to announce the latest components for its comprehensive line of stage lighting fixtures and controllers. Built to exacting professional standards to provide the most vibrant illumination, scalable flexibility, and reliable performance in its class, the Venue series’ LED technology minimizes drops in brightness when the LED elements warm up over time, retaining premium performance and brilliance. As a result, your show will look as good at the finish as it did at the start. The Venue series includes the Control16 16-channel DMX controller and three LED fixture models that can be mixed and matched to create custom systems, providing complete scalability for shows both large and small. Each fixture provides dual-stage optics, with flicker-free operation that looks good on camera, and a robust, clear lens cover that protects LED elements from dust, dirt and moisture. Rugged dual-yoke and chassis construction offers precise and stable aiming from stands, trusses, and floors. For outstanding overall light coverage, the compact ThinTri64LED fixture features twelve 3 watt, tricolor LEDs that combine spectacular brightness, vibrant colors, extreme durability, and simple operation. 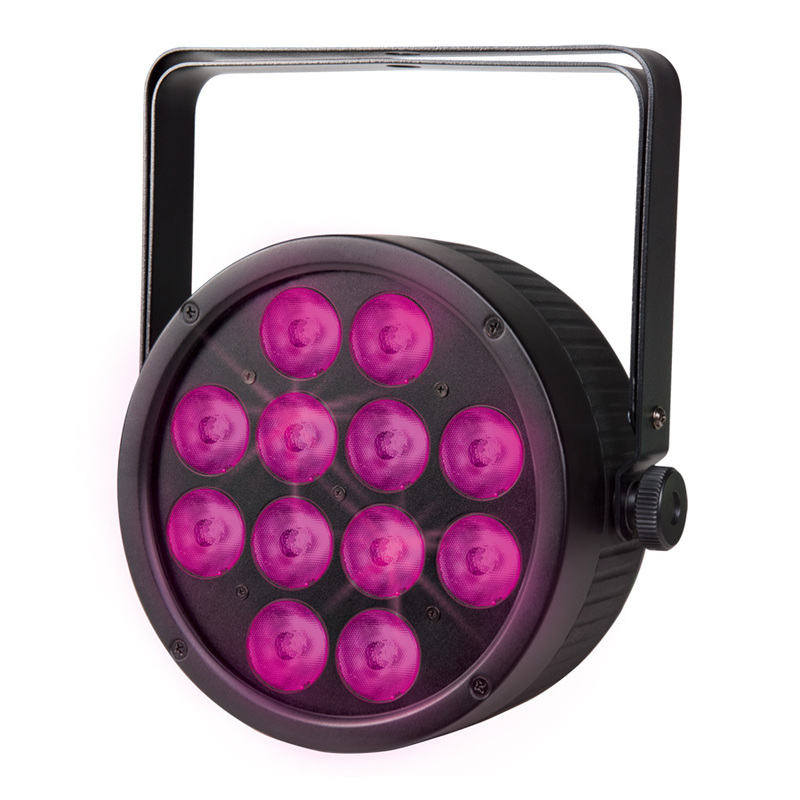 The ThinTri64LED offers four operating modes (Stand-Alone, Sound Active, 3-channel and 4-channel DMX modes, and Master/Slave), seven static colors, 236 color macros, 4 preset color programs, strobe, dimming, and manual color mixing. It also includes pass-thru DMX and AC connections for neat cable management. Completing the series, the TriStrip3Z color batten stage light combines equally spectacular brightness, vibrance, and durability, and flexible operation in a thin batten that is perfect for up-lighting effects, cyclorama, and focused down-lighting applications. This fixture features twelve 3 watt, tricolor LEDs and is organized in three zones for maximum color options. Its four operating modes include Stand-Alone; Sound Active; 3-, 6-, 8-, 9-, and 14-channel DMX modes; and Master /Slave; and it offers seven static colors, 236 color macros, 14 preset color programs, strobe, dimming, and manual color mixing. The TriStrip3Z is constructed with sturdy adjustable feet and multiple hang points for precise aiming from stands, trusses, and floors. Like the ThinTri64LED and ThinTri38LED, it includes pass-thru DMX and AC connections for neat cable management. The TriStrip3Z, ThinTri38LED, and ThinTri64LED fixtures integrate seamlessly with Proline’s Venue Control16 16-channel DMX controller to create an integrated and cohesive color show that will rock any venue. The versatile Control16 provides simple, elegant control of multiple lighting fixtures with four banks of four faders. Each bank operates an independent four-channel controller with access to manual color mixing, preset color pallets with nine built-in colors, variable strobing on the fly (2 to 33 Hz), chase (to manually trigger automated programs), and blackout functions. An Auto mode randomly selects different colors for each fixture. Playback options include automated, sound-activated, or manual RGBW. You can vary fade times for all playback modes and can adjust audio sensitivity. The Control16 color pallets are designed to work with any lighting fixture, using a standard DMX three-channel RGB mode. The fourth fader can be used to control amber, white, or UV color mixing for quad-LED fixtures. When combined with Venue’s TriThin38LED, TriThin64LED, and TriStrip3Z fixtures, it produces lighting effects that will wow the crowd all night long. Venue by Proline products are available now at Guitar Center retail stores, Musician’s Friend, and guitarcenter.com.